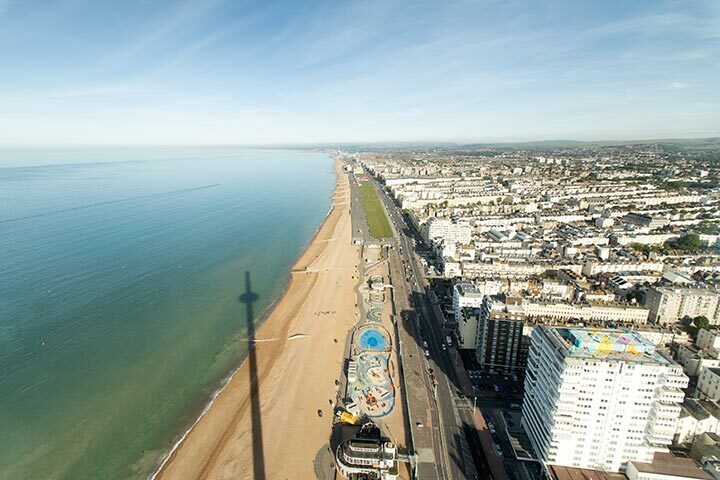 Take to the skies to see Brighton and the beautiful south coast as you have never seen them before. 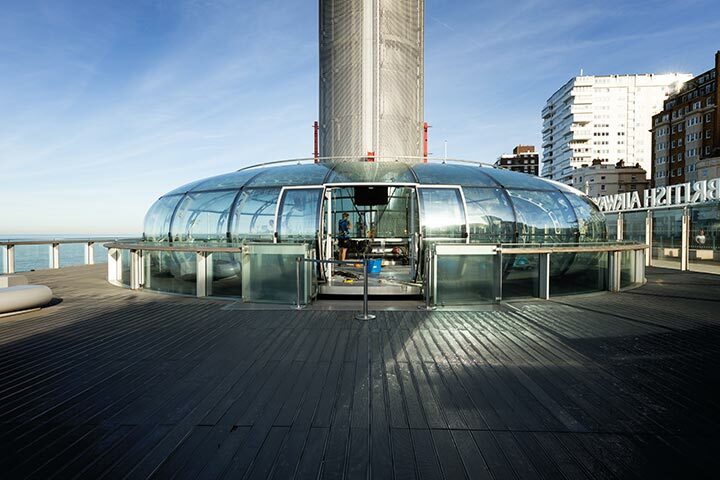 Glide up gently to 450ft in the futuristic glass viewing pod, which was conceived and designed by Marks Barfield Architects, creators of the London Eye. The friendly in-flight crew will welcome you on board, point out landmarks and answer any questions. The pod is heated and air-conditioned to ensure year-round comfort and it is fully accessible for wheelchair users. A viewing map is available and a multi-lingual app can be downloaded before you board. 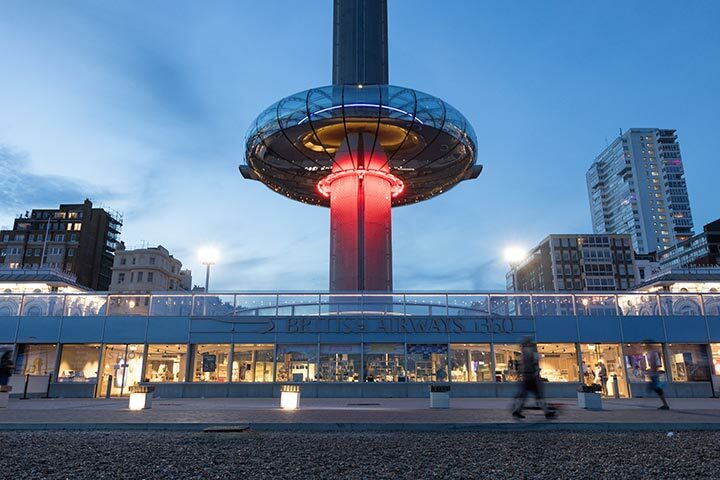 The app has ‘pre-flight’ information about how British Airways i360 was built, as well as an in-app viewing map and a children’s section with fun facts and a treasure hunt. The content can be enjoyed in a choice of languages including English, French, German, Spanish, Italian, Dutch, Portuguese, Russian, Japanese and Mandarin. 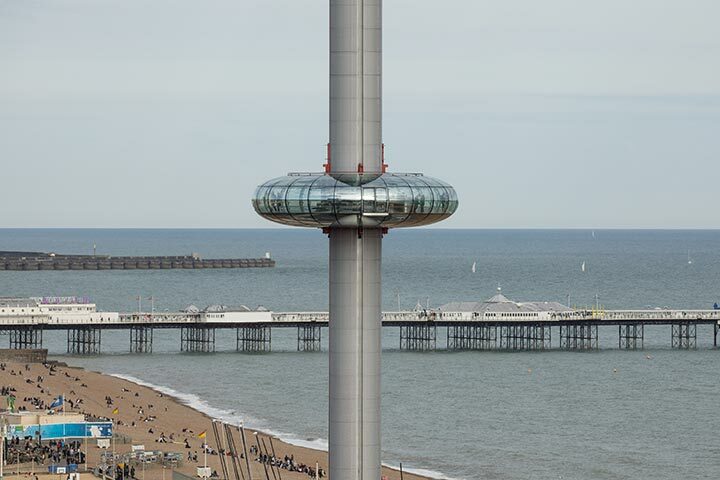 At the end of your flight, the pod descends into the beach building at the base of the tower, with terraces opening straight out onto the promenade. 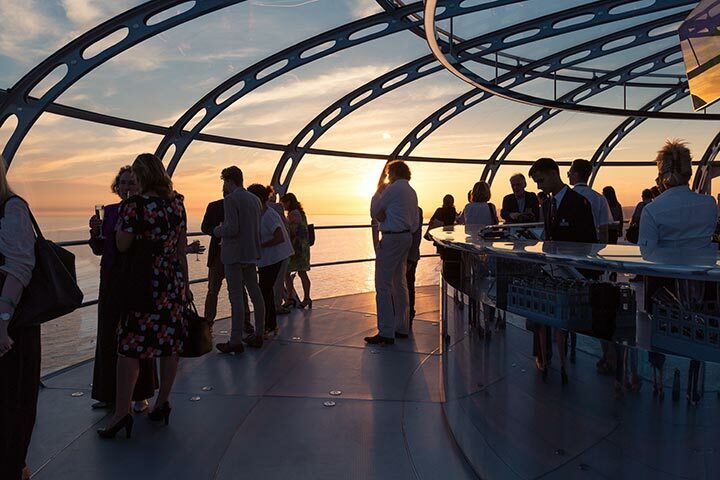 There you can enjoy delicious food at West Beach Bar & Kitchen, browse the shop to find stylish gifts inspired by British Airways i360 and the surrounding environment, visit the construction exhibition or host an event in the beachfront events spaces. Half kilo of rope grown Shetland mussels steamed to order and served with frites. 5oz Black Angus ‘minute’ rump served with frites or house salad. Chargrilled chicken, chichory, frisée, watercress, beetroot, carrot, red apple and chopped hazelnuts. 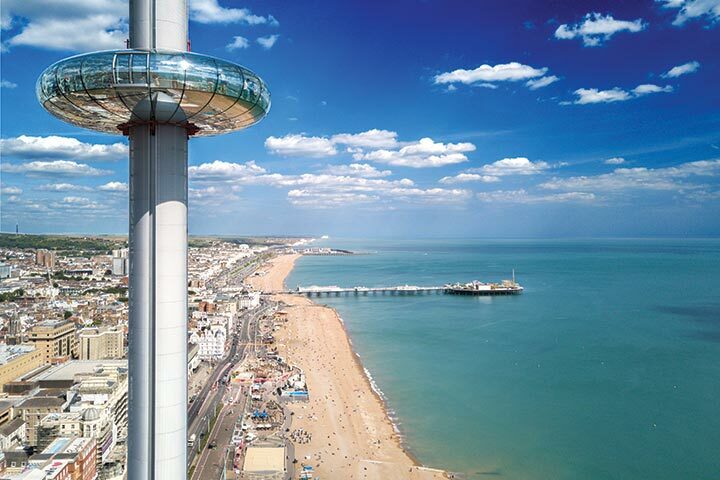 Expect to be at the Brighton i360 for around an hour, your meal will last approximately two hours. Excellent views great experience - we were lucky to have a very clear day. We had this experience as part of another in Brighton as part of our 20th Wedding Anniversary celebrations. 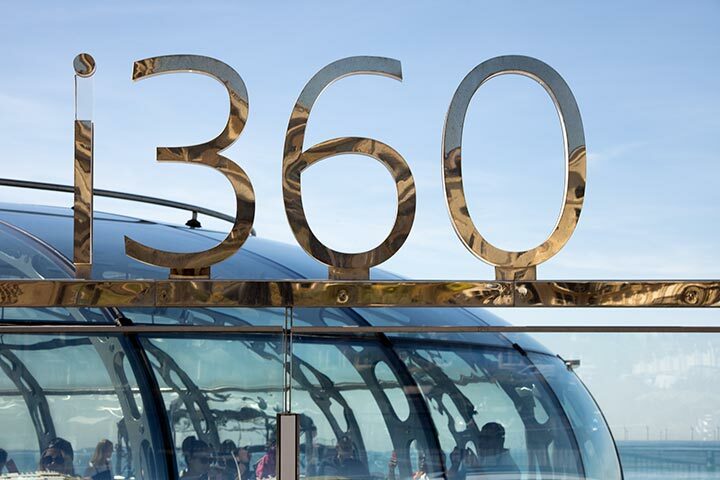 The views from the i360 were amazing and you could even have a nice glass of Bubbly while you was up there if you fancied paying £10 per glass. After this we had a very relaxing 3 course meal with a glass of Bubbly, wine or soft drink if you preferred. The choice of menu was rather restricted but we both found something lovely to eat and the quality of the food was exactly what you should expect from Cafe Rouge. All in all a very good experience if you are ever down in the Brighton area. I was given this as a present and was very surprised by how much we enjoyed the whole experience. There was only one small thing, the toilets in Café Rouge could have been better, we have used many Café Rouge restaurants and the toilets have always been good. But I must say the food was very good as usual. I was given vouchers at Christmas and finally got round to using them. Very interesting views when you reach the top. Even though it was very busy it was well organised, plenty of room to move about. Overall I enjoyed the experience and would recommend giving it a go . Being disabled didn't give me any problems. Only two problems I encountered:- 1 the obligatory photographs before you go in delays everything and causes a jam at the security desk. 2 the day I visited was extremely hot and you have to queue for half an hour outside the entrance where there is no protection from the sun or if it had been raining we would have been soaked. Minor point it needs a sign to show where the lift is to get down to the lower level especially if you are disabled. Experience was a present for my birthday. i360 in Brighton was great, got there early & was allowed to go on the earlier flight. The meal at cafe rouge on the other hand was poor, limy menu with half the stuff not available. Service was slow & food was average. Thank you for your review. Whilst I am pleased to hear that you enjoyed visiting i360, I am sorry to hear that you felt the food at Café Rouge fell below expectations. I hope this did not take away from the overall enjoyment of your experience. Thank you once again for your valuable feedback and I am sorry for any inconvenience caused.